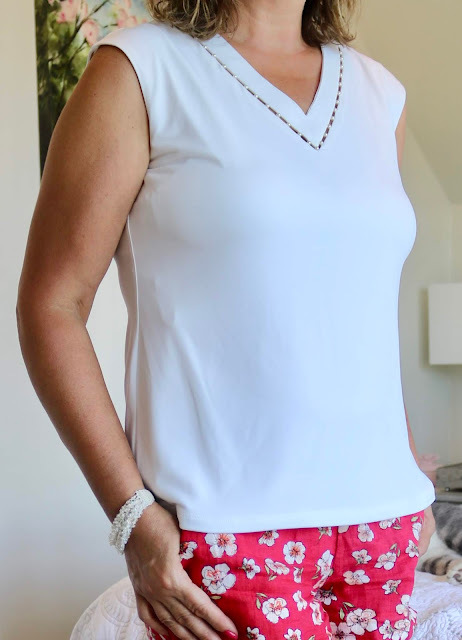 It's a new month and time for a new Stitch Fix Review. Last month, Stitch Fix #17 was a pretty good Fix and I kept 3 out of 5 items. This month, it wasn't so good and I only kept one item. It wasn't as if I didn't like anything; I actually liked everything. There were just two items I did not need at all, or the cut and fit wasn't quite right. For this review, instead of reviewing one piece at a time per post, I'm gonna review four items in this post and then I'll review my fifth item next Monday. First up, this denim jacket by Liverpool. I can not say enough good things about this jacket. It is made of an "Extreme Stretch" denim so it is SO COMFORTABLE! My biggest beef with denim jackets is that they feel stiff and uncomfortable to wear. This one does not. It feels soft to the touch, and it moves and gives with you. BUT, I already own two denim jackets and I just couldn't justify spending $100 on another one, even if it's more comfortable. Liverpool Kolten Denim Jacket: RETURNED. Next up is a lovely white Calvin Klein top and Kut From The Kloth shorts. First I'll review the top. I'm a sucker for white, especially white tops. I can't even begin to tell you how many white tops I already own. Yet, every time I'm looking in my closet for a white top to coordinate with an item, I never seem to have the right one. So when Stitch Fix sent me this white top I had a pretty good hunch from the minute I opened the box that this would be a keeper. First, it's sleeveless: perfect for wearing under cardigans or jackets in the colder months, and cool enough to wear alone in the warmer months. Second, it's made of a jersey knit type of material, so it's comfortable and will not need to ironed. And finally, it has a great fit. But perhaps the best reason for keeping this top is this gorgeous neckline. It has little pearls sewn into the V neck. Gotta love Calvin Klein for these great details. I kept another white shirt from Calvin Klein in my last Fix too. It also had great details. Calvin Klein Elexia Pearl Knit Top: KEPT! Now to review the shorts. My stylist sent me these shorts because I pinned them on my Stitch Fix board. But I actually pinned an outfit, and I think I liked the top and bag more than the shorts. These shorts are pretty cute. I love the color and print. I also love that they are made of linen. I love the comfort of linen shorts. BUT, I just purchased a pair of solid red linen shorts so I really didn't think I needed these. I also felt the rise was too low and the length was a little shorter than I prefer. The shorts have a elastic waist band. Because the rise is so short, it makes tucking in shirts difficult. And then because the length of the shorts is so short, if I left the shirt un-tucked, I felt you couldn't see much of the pretty print. The next item in my Fix was a pair of sneakers. I must admit when I saw a shoe bag in my box I got so excited. I am such a huge shoe lover! But when I opened the bag and saw that they were sneakers, my heart sank. I really don't wear sneakers all that much; usually only if I know I'll be walking a lot when traveling. I just feel they make me look frumpy. Yet, I love them on every one else. But when I put them on, I feel like a frumpy housewife, so I try to avoid wearing them if I can. I will say that these sneakers were SO COMFORTABLE. My stylist said they had a "padded footbed". I almost kept them for this reason alone, but I really didn't need them. I already own plenty of sneakers, and I hardly wear any of them. They do have this interesting detail on the back. And another interesting detail is that the sneakers are "collapsible"; so you can easily throw them in a bag if you want to wear them to walk to work and change into other shoes later. They really are super cute sneakers. I loved the chambray fabric. They actually were kinda hard to send back because ya'll know I'm all about comfort, especially for my feet, and I LOVED how comfortable these sneakers were. If I didn't already own about 50 pair of sneakers, I would have kept them. haha! So, what do you think? Did I make the right decisions? I'd love to hear from you in the comments below. Next Monday I'll review one more item from this Fix: a jumpsuit! You look super in everything and you always look so cute with whatever you wear, nothing frumpy-housewife about our lovely Amy! Know what you mean about denim jackets, I have an old Gap one and it us so stiff it feels like I'm wearing medieval armour. But can understand that three jackets is one too many! Hugs, x.
Awww, thank you! And yes, mine are stiff too which is why I wanted to keep this one; but $100???? Yikes! That's what I'd pay for a good winter coat, not a jean jacket. Super cute outfit and smart to keep the top..a cute white top will see a lot of water. happy Fri-yay! Thanks Andrea, I haven't worn it yet, but I'm glad I kept it. Isn't it funny how we can feel unflattered in certain items? Though I am still trying to see if there is a way I can wear denim jackets I usually don't like how they look on me--they always make my outfit feel too "normal." (Though I love them on others!) It's one of those interesting parts of fashion. You know, I kinda feel the way about denim jackets too; that I like them on other people but not me. I've also heard other women say that. It must be a thing about denim jackets. They are very masculine and I feel because I have a broad back they are not flattering. Not crazy about the color. That is so weird that they are sending you 2 denim jackets. That has never happened to me before. I did google these jackets and they do cost $100, so Stitch Fix is not marking them up. I have never peeked at my Stitch Fix box. I like to be surprised. I think you made the right decisions. Enjoy your top! I definitely like the white top on you, it's very chic and you can dress it up or play it down. I think you made the right decision on the shorts, they don't look like they fit right, but I'm sad about the sneakers! They look so cute and comfy! Thanks May. I have a very long torso and anything with a short rise usually doesn't work for me. Yes, I'm kinda regretting sending back the sneakers. They were so comfy and they might have come in handy on vacations. I think you look really adorable in that whole outfit, Amy! I would have had a hard time sending the items back, too. Collapsible shoes sound awesome for carrying around. I love that white top and can see why you kept it. I have two blue jean jackets by Gloria Vanderbilt that are that stretchy fabric and I love them-so comfy! Bought them at Sears for only around $25 each. You might look for that brand if you would like a stretch fabric. Thank you. I always have a hard time sending things back. It's the worst part of Stitch Fix...having to send things back. I am going to check out those jackets. That's a great price. You will get a lot of wear out of that pretty top. Great piece. You look adorable in the whole outfit but I understand about the shorts and the denim jacket. Wish I could trade my stiff denim jacket that I dislike wearing for that stretchier version. And I prefer the darker color of that one over my stone washed one. But could never afford that price tag. The shoes sound like winners. How handy that they can be collapsed in a bag or suitcase. I hate packing tennis shoes because they hog so much room in my luggage. Those tennies are cute, sound comfy and have that great feature. I think it would have been hard for me to return them. You have such willpower and are so practical. Thanks Leslie. Too bad there's not a denim jacket trade in store where we could trade our older versions in for the new stretchy version. haha! I regret not keeping the sneakers. But, I really would not have gotten much use of them. I just love those elastic waist shorts, but I agree... they're just a little too short. You actually have great legs and they look good on you, but I'm like you... I like just a little more length and then you can have the choice to wear a shirt tucked in or not, etc. I didn't know Stitch Fix carried Calvin Klein! That is nice to know. I am itching to get another Stitch Fix box in the early fall. I wasn't crazy about my 2 summer boxes, but I'm hoping that'll change. I had a denim jacket from ON and like you said, it was very hard and not stretchy. Stitch Fix sent me a denim jacket last year and it was SO comfortable and I loved it much more. I did land up keeping it and I wear it all the time. I love the pearl details in that white top!! My stylist has been sending Calvin Klein in every single box. I think it's because i'm over 50. I have enjoyed almost every Calvin Klein piece I received though. I thought so seriously about ditching my old denim jackets and keeping this one, just because it was so comfortable. But $100 was just too much for me. I don't get a lot of use out of lightweight jackets in my cold climate. But, I will keep an eye out for a less expensive one! I do love those sneakers!! I have to admit they are super cute and I have been wearing sneakers more and more!! I loved the shorts too but the waistband might have put me off?? Thanks Jodie, they were such cute sneakers, I just didn't think I'd wear them much to get much use out of them. I agree about the waistband. It would have been nice to have a tie or something other than just elastic. What a cute look dear! Love the shorts, so pretty for summer! You received some great items in your fix this time around. I feel you about the white shirts - I am the same way! The detail around the neckline is fantastic. I have a light denim jacket that is really soft and stretchy like you are describing. I love wearing it because it is so comfortable. Those chambray sneakers are so cute! You do not look like a frump in sneakers! Thanks Jennie, yes, I know you love to collect white tops too! You have some gorgeous ones. Totally think those shorts are adorable on you! I received a denim jacket this month too and I loved it but it was a little big and I was afraid the size down would have been too snug. Will probably regret not exchanging! That's the one thing I don't like about Stitch Fix: I often regret either sending something back that I wish I would have kept. Sometimes I regret keeping certain items too. It's hard for me to decide what to keep and what to send back.